The GENERAL CARGO “NORTH STAR”, IMO N° 7811410, flying the Moldova Flag, sailing from TENES (ALGERY), arrived in Marina di Carrara Harbour on 17 May 2017 for cargo operations (marble blocks), with Priority 1 and was subject to an Expanded Inspection. Moreover, the vessel did not comply with the mandatory requirement imposed by Directive 2009/16/EC - article 9 (“notification of arrival of ships”). The Port State Control team attended the vessel on 18 May in the morning. Prima facie, the vessel appeared to be clearly substandard, with worn and partially unreadable immersion scales, either bow or aft and a considerable level of rust and indentations affecting the hull. Since the first approach, the Port State Control inspectors noted the unsafe gangway, with twisted and damaged steps. Later, whilst checking the rectification of the outstanding deficiencies, the inspectors recorded that as “recurrent deficiency”, still in place and not rectified from the previous PSC inspection. During boarding procedures, the inspectors realized that crewmembers on watch - in charge to control access to the ship and embarkation of person and their effect - were not able to fill out the visitor’s log book and check ID documents, being unable to write and speak in English, despite of being the working language on board. After a short briefing in the Captain’s office in order to explain the reason and the kind of inspection to be performed, the Team split in two for verification of ship’s documents and crew certificates and for performing operational checks. As per PSCC Instruction 49/2016/09, operational controls involved all the ship, but nothing appeared to be in a good order. At the second deck, just under the main deck, the ceiling bulkheads of the room leading to the steering room was cracked with evident signs of corrosion and water penetration from the upper deck; most of the lights were found inoperative, including all the emergency lights. Port State Control inspectors discovered that, due to a serious failure, the electric system was inoperative, as well the emergency generator and the emergency fire pump! The vessel was detained in Marina di Carrara for 21 days, from 18 May to 7 June 2017, recording 29 deficiencies in total of which 21 were detainable deficiencies. 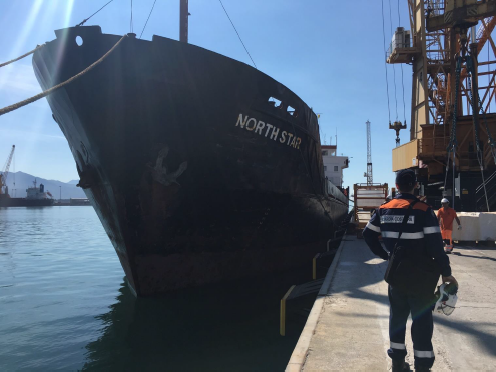 MV NORTH STAR was released from detention and granted to left the port of Marina di Carrara bound for Yalova (TK) repair yard, with a single voyage authorization issued by the Flag State, accepted by Italian PSCOs and Turkish Maritime Administration. The vessel departed on 17 June 2017 after 21 days of detention and called at Yalova on 18 June 2017.